A 54-year-old man with polycystic kidney disease on automated peritoneal dialysis (APD) was seen for peripheral edema. His BP was 165/93 mm Hg and his weight was 85 kg (previously 82 kg). Jugular venous distension, peripheral edema, normal cardiac and respiratory examinations were noted. He received a peritoneal dialysis (PD) prescription of five 2-L overnight exchanges of 2.5% dextrose (over 9 hours) and a 2-L all-day dwell of 2.5% dextrose. His residual urine output was 600 ml/d, with furosemide 80 mg daily. A peritoneal equilibration test (4.25%) demonstrated high-average transport status, and ultrafiltration (UF) of 750 ml. Hypervolemia results from a mismatch between dietary salt and water intake and removal. In the volume overloaded patient on PD, it is important to consider (1) increased salt or water intake, (2) decline in residual kidney function (RKF), and (3) inadequate peritoneal UF (relative to the patients’ needs). Drivers of decreased peritoneal UF include PD nonadherence, a suboptimal prescription, peritoneal membrane changes, and mechanical PD issues leading to fluid sequestration. Hypervolemia may also be accompanied by fluid compartment disorders, such as cardiac or liver disease. Such patients may appear to have an expanded total body volume but may have ineffective intravascular volume. Here, some degree of “permissive edema” should be tolerated, avoiding the hypotension and/or premature loss of RKF, which may ensue with overzealous UF. It is important to differentiate mechanical problems such as PD fluid leaks from true hypervolemia because both may present with decreased peritoneal UF and/or weight gain. Peri-catheter and genital leaks are suggested by localized abdominal and/or genital edema, and usually occur shortly after PD initiation or addition of a day exchange. Pleural leaks usually present with dyspnea and symptoms may worsen with increasing peritoneal UF because of greater movement of fluid into the pleural space. A chest x-ray usually demonstrates a unilateral, right-sided pleural effusion. Mechanical PD catheter dysfunction presents with diminished peritoneal UF, but is self-evident by prolonged inflow and/or outflow during a flush/exchange, frequent APD alarms, and lost dwell time. Peritoneal UF is the net movement of fluid across the peritoneal membrane minus an obligate volume of peritoneal lymphatic reabsorption (80–90 ml/h). Rarely, patients receiving incident PD present with early, poor UF because of excessive lymphatic absorption. The clinical picture entails large, persistent PD fluid reabsorption despite icodextrin or hypertonic dextrose dialysate and requires a switch to hemodialysis (1,2). Having identified the potential cause(s) of mismatch between intake and output, we suggest a stepwise management approach (Figure 1). A stepwise approach in managing a patient on PD with volume overload. APD, automated peritoneal dialysis; ICO, icodextrin; PD, peritoneal dialysis. Patients should be counseled to reduce dietary sodium intake to <2 g daily. Fluid intake should be restricted guided by what is achievable via the patient's typical 24-hour fluid removal (UF and diuresis). Diuretics enhance diuresis with as little as 100 ml of daily urine output. RKF monitoring is necessary. Diuretic use is a more metabolically appealing means of fluid removal over increasing dialysate tonicity. Maximal loop diuretic doses can be used up to 320–400 mg/d, best administered as divided doses (3). Ototoxicity concerns have been described with intravenous but not oral administration (4). Adjunctive distal diuretic use, such as metolazone, may further enhance natriuresis. Considerations in optimizing peritoneal UF include patient lifestyle, type and concentration of PD solutions used, duration of dwells, and peritoneal transport characteristics. APD Cycle Length and Duration. On average, maximal UF usually occurs after 140 minutes with 1.5% dextrose and 247 minutes with 4.25% dextrose (5). UF increases with increasing dextrose concentration because of the greater osmotic gradient. Maximum UF is typically 330±187 and 1028±258 ml for a 1.5% and 4.25% dextrose solution, respectively (5). With dextrose-based solutions, small pores and water-selective aquaporins participate in water removal, whereas sodium moves only across small pores. Early in the dwell, aquaporin relative to small pore water movement is greatest, potentially leading to more free-water transport compared with sodium-coupled water transport, a phenomenon called sodium sieving. The clinical consequence may be hypernatremia, which may stimulate thirst, potentially exacerbating hypervolemia. With excessively short APD dwell times, there is a greater risk of sodium sieving, particularly with hypertonic solutions. Furthermore, the time to fill and drain each exchange can take 15 minutes each, longer with constipation and PD catheter dysfunction. We recommend a maximum of five overnight cycles in a 9-hour period in a high/high-average transporter and four cycles in a low/low-average transporter. Total cycler treatment time should be guided by the patient's typical duration of sleep. Additional cycles extending therapy beyond 9 hours are impractical because of lifestyle and vocational considerations. Possible sodium sieving during APD makes the daytime exchange an important component of both fluid and sodium removal in APD. During long exchanges, the loss of the glucose gradient may lead to absorption of PD fluid, and an early drain of the long daytime exchange may facilitate enhanced fluid removal. Persistent hypervolemia should prompt an additional daytime glucose-based exchange that may enhance UF. A “mid-day exchange” need not always be at mid-day, and timing can be flexible. Alternatively, a single icodextrin exchange (7.5%) can be considered for the long dwell. Icodextrin, a high-molecular-weight glucose polymer, acts as a colloid osmotic agent, providing slower, more sustained UF usually without fluid absorption during the long dwell. Recent studies have demonstrated superior peritoneal UF with icodextrin compared with glucose-based solutions in the long dwell (6). With identical UF volume, there is more sodium removal with icodextrin compared with glucose-based solutions as UF occurs across the small pores, not aquaporins. Maximal UF typically occurs at 10 hours (7), so one may consider a shorter 10-hour icodextrin dwell followed by either a dry period or a 4–6 hour glucose-based exchange as needed to maximize UF. Twice daily icodextrin may enhance fluid removal, but experience is preliminary (8). Thereafter, persistent fluid overload should prompt a consideration to increase dialysate tonicity, taking into consideration deleterious metabolic and peritoneal membrane consequences related to greater glucose, and glucose-degradation product exposure. 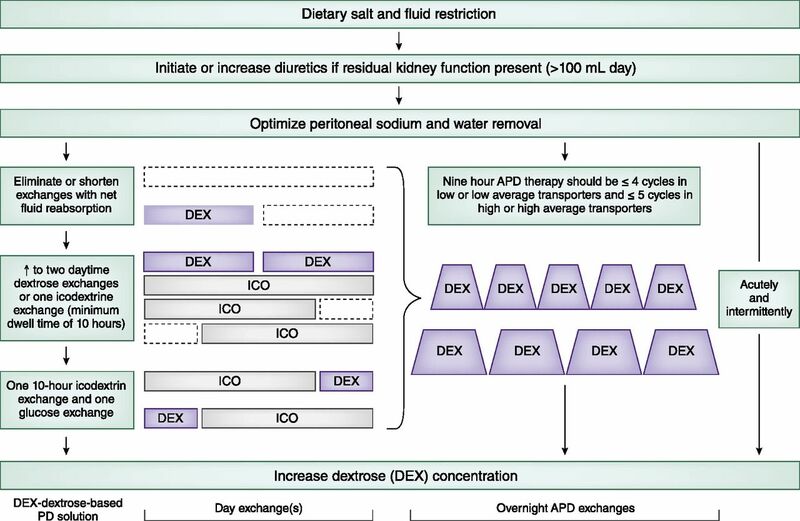 During severe, symptomatic volume overload, short-term frequent hypertonic solutions (4.25% dextrose every 3–4 hours) should be prescribed as either manual exchanges or via APD, continuously, at day and/or night. Critically ill patients (i.e., intensive care unit, acute myocardial infarction, post cardiac surgery) need not be routinely switched to hemodialysis particularly with the intendant infection risks of a vascular access. Pitfalls are failure to prescribe diuretics in those with RKF, ordering too rapid exchanges limiting adequate time for UF, and failure to recognize the hypokalemia that may ensue with high-volume PD. Icodextrin should not be used in acute symptomatic volume overload because of the slower fluid removal profile relative to dextrose solutions. Patients with anuria are at higher risk for volume overload, and greater total daily peritoneal UF is associated with superior survival (9). Strategies that maximize day dwell sodium and water removal become increasingly important. New, lower dialysate sodium solutions (not universally available) stimulate greater diffusive peritoneal membrane sodium loss and may show promise in this patient subset. When Should a Transition to Hemodialysis Be Considered? A transition to HD should be considered when hypervolemia persists despite the abovementioned measures or there is an ongoing frequent need for hypertonic 4.25% dextrose, particularly with UF failure confirmed by peritoneal equilibration test (net UF <400 ml/4 hours, 4.25% dextrose [as the preferred method] or <200 ml/4 hours, 2.5% dextrose) (10). Anuria alone is not an indication to switch to hemodialysis. Twice daily icodextrin (for 8 hours per session) has been useful in our experience as a salvage therapy in patients reluctant to transfer to hemodialysis (8). In those with volume expansion because of excessive salt and water intake despite a reasonable daily peritoneal UF (i.e., >1–1.5 L/d), volume management challenges often persist on conventional hemodialysis. Dietary counseling to limit salt and water intake was performed. Furosemide was increased to 120 mg twice daily, with metolazone 2.5 mg/d, titrated to 10 mg/d. Absorption of the daytime exchange led to it being shortened and drained at noon. The day dwell was changed to icodextrin because of lifestyle considerations. At 3 years, volume expansion recurred along with anuria. The icodextrin exchange was shortened to 10 hours, and an additional glucose-based exchange was added before overnight APD, with improvement in symptoms. E.T. has no disclosures to declare. J.P. has received salary support from Arbor Research Collaborative for Health, speaking honoraria, consulting fees, and research support from Baxter Healthcare, speaking honoraria from Fresenius Medical Care and DaVita Healthcare Partners, and consultancy fees from Fresenius Medical Care and Baxter Healthcare. We thank Dr. Jeffrey Zaltzman for the careful review of this manuscript.